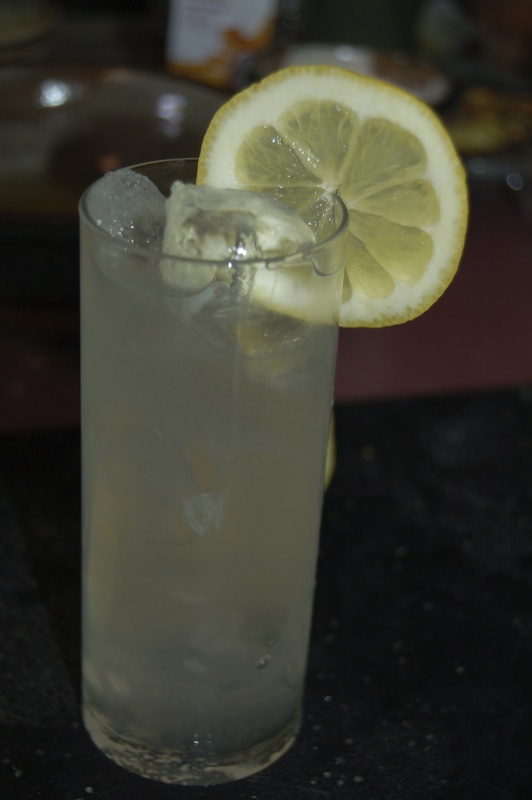 The Amazing Lemon Squeezer and A Great Lemonade Recipe (makes little or lots!) | Crappy Kitchen - Good Dinners! Have you ever gotten a gift from someone and you think, “gosh, I would never have bought that!” Well this was the Christmas present I received from a woman who I thought would never have bought something like this either? She does not strike me as the “gimmicky” type, however when she gave me this contraption she made sure to justify her reason for buying it. This is The Amazing Lemon Squeezer! Anyway, I had to open it on the spot as she wanted to assure me that as odd as this thing might look, she had it from a couple of good sources that it worked like a charm and that it could be that kitchen gadget I may not be able to live without once I squeezed my first lemon! Well that was 5 months ago and other than me moving it out of my way to find something in that draw we all have, you know the one? The drawer that is a tangle of dangerous items like kitchen scissors, pizza cutters, metal kebab skewers and various specialty knives all bound together in a mysterious solid mass. There it languished, unused and ignored, that is until the weekend before last when my daughter wanted to set up a Lemonade Stand (Read about that HERE!). I was faced with the task of squeezing mounds of lemons and suddenly remembered Susan’s gadget-y gift! Squeezing about 30 lemons was a true test for this highly touted tool, and it passed the rigors of my relentless compressions! As I squeezed lemon after lemon I kept remarking how great a job it was doing and felt a little guilty about my contempt upon first seeing it. 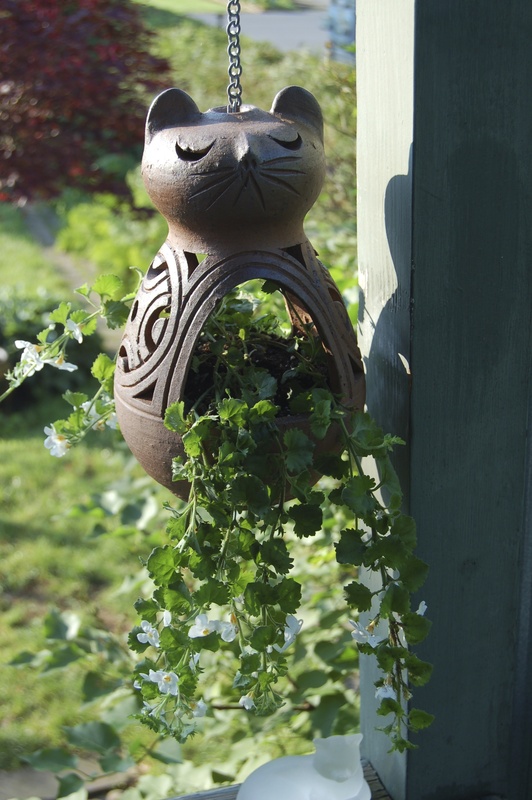 Another garden update: I planted this little flower in my cat planter but it seems this cat cannot be pleased! It has now been promoted to a nicer spot in my kitchen and the next time I see Susan I must properly thank her for this juicing gem! 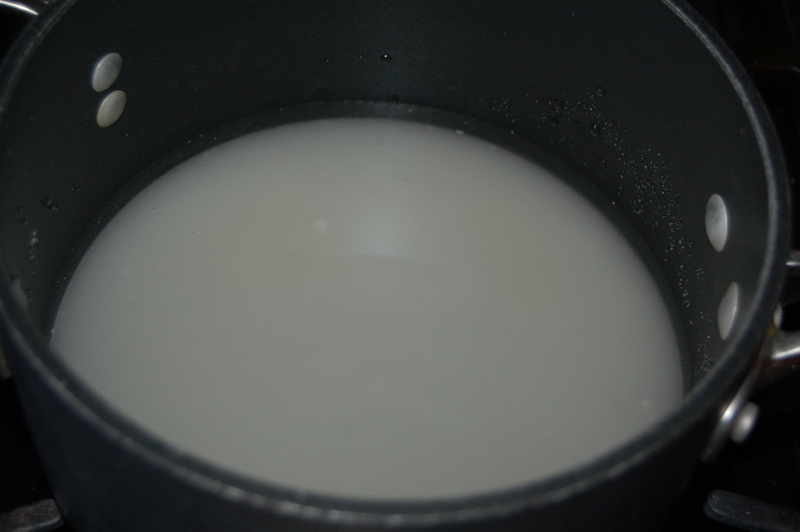 1 – Mix 4 cups of water with the sugar in a pot and place on medium heat. Heat (stirring occasionally) until sugar completely dissolves. Turn off heat and set aside. 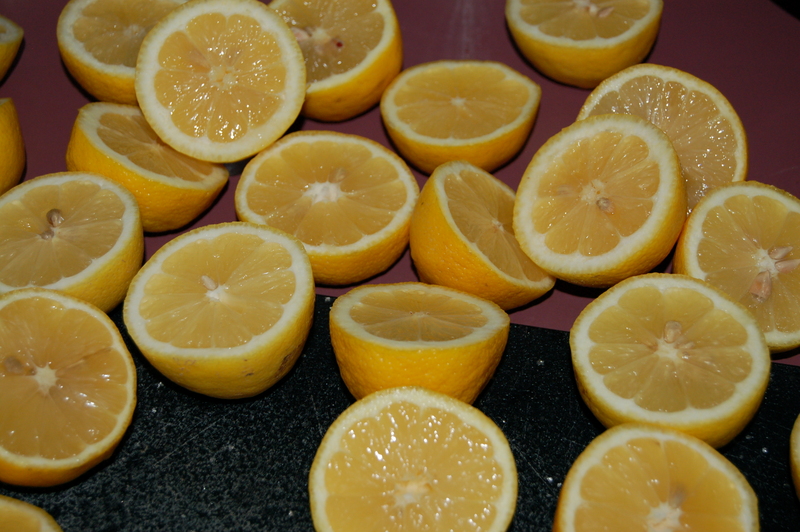 2 – Before cutting the lemons roll back and forth on your work top using a little pressure as you do so. This will soften the lemon and release more juice. 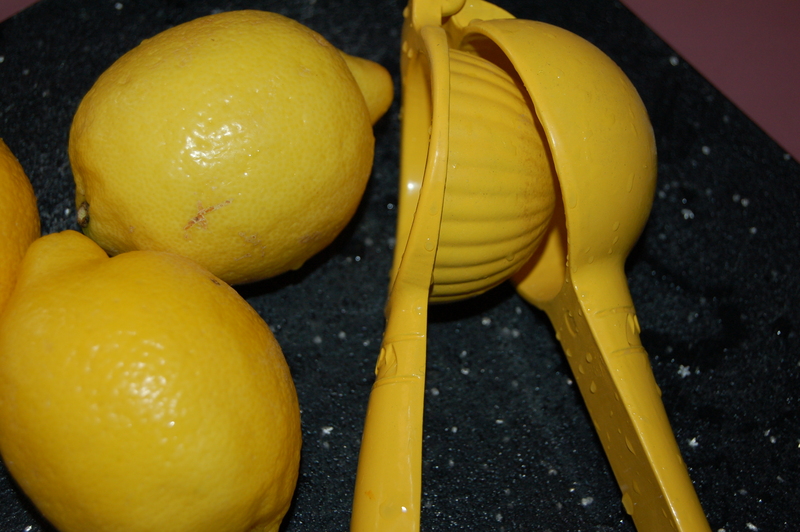 Cut the lemons and squeeze juice into a large bowl. 3 – add about 18 cups of cold water followed by the simple syrup mixture (it’s fine if it is still hot or warm). Mix everything together and taste. 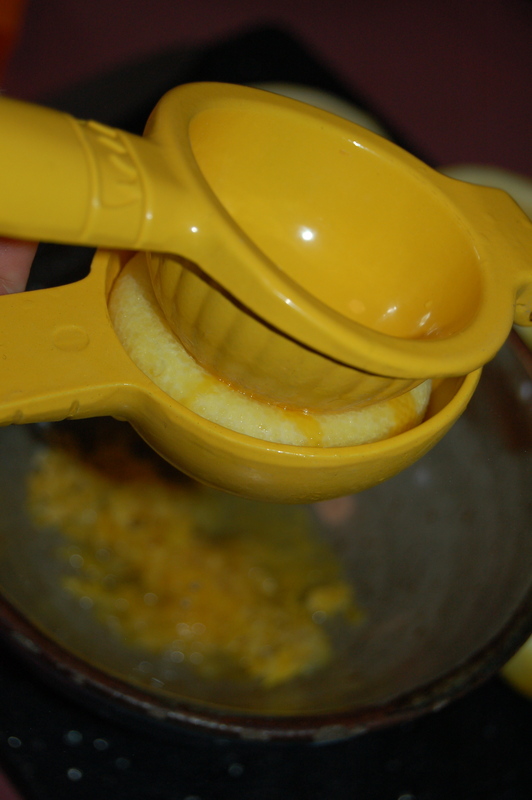 Add more water if it is too strong or more lemon juice if you want more tang. Serve over lots of ice in tall pretty glasses! 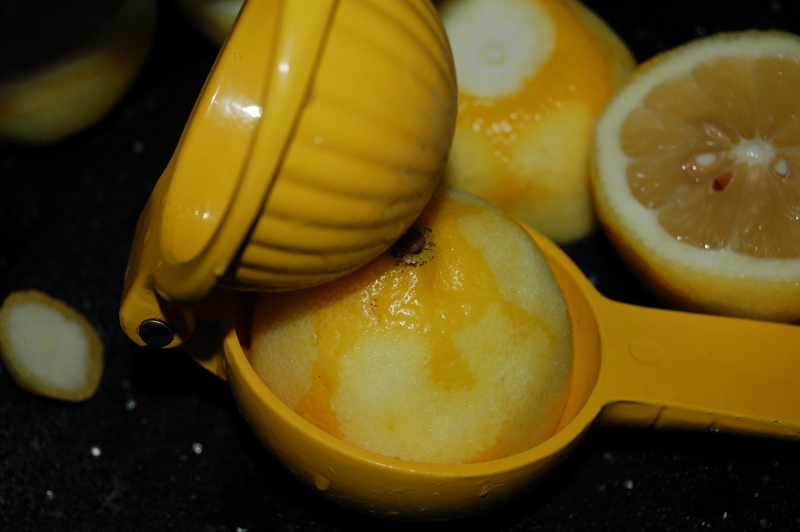 This entry was posted in Stuff I like, Sweet Stuff and tagged gift, juice squeezer, juicer. 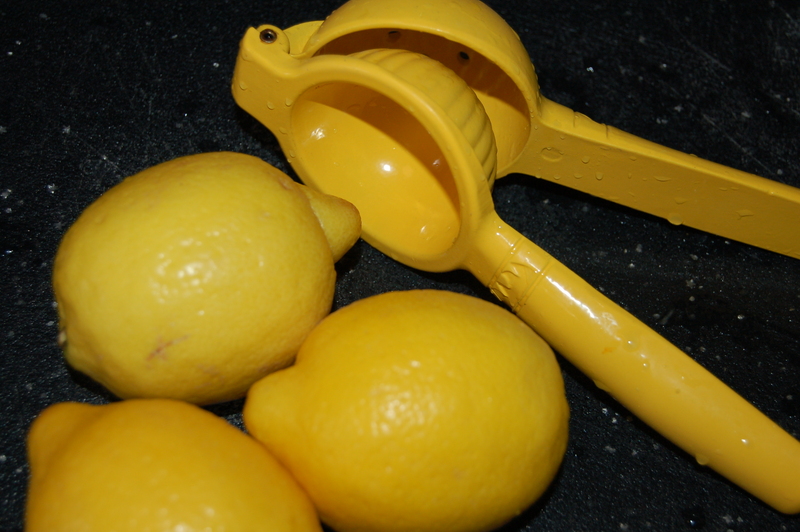 lemon squeezer, kitchen gadget, kitchen gift, kitchen tools, lemon, lemon juice, lemon juicer, lemonade, lemonade stand, lemons. Bookmark the permalink.